On my shelf rests a copy of the book Flatbreads and Flavors, also written by the contributing authors and while I love the book itself, I can honestly say that every recipe I have tried is finicky, hit or miss or just disappointing. It seems that each one requires multiple steps and methods to recreate breads that are baked in rustic kitchens and I have had very little luck getting the results hoped for. While this recipe is probably the closest to success achieved in my kitchen, it still left me a little frustrated. First of all, the flour needed was more than the 4-5 cups the recipe called for and to be honest, I think it ended up a little on the tough side from my choice of bread flour; the recipe calls for bread or all-flour to be used. Even so, after a quick rise, the dough was so sticky that I had to use a little flour to shape the rounds. Then of course, the lack of mahlab in the dough left me wondering about the flavor. At some point, I need to venture back to the International grocery store to see if I can find it but that is a 30 minute drive for another day. To give my breads a typical pretzel finish, I chose large crystal salts and luckily for me, I have a friend who thinks of me. After a trip to Hawaii, my wonderful friend sent me some pink Hawaiian Alaea and black lava salt and I sprinkled a little of them over some of the breads because as much as I like sesame seeds, they aren’t salt and a pretzel isn’t a pretzel without salt! Would I make these again? Maybe. 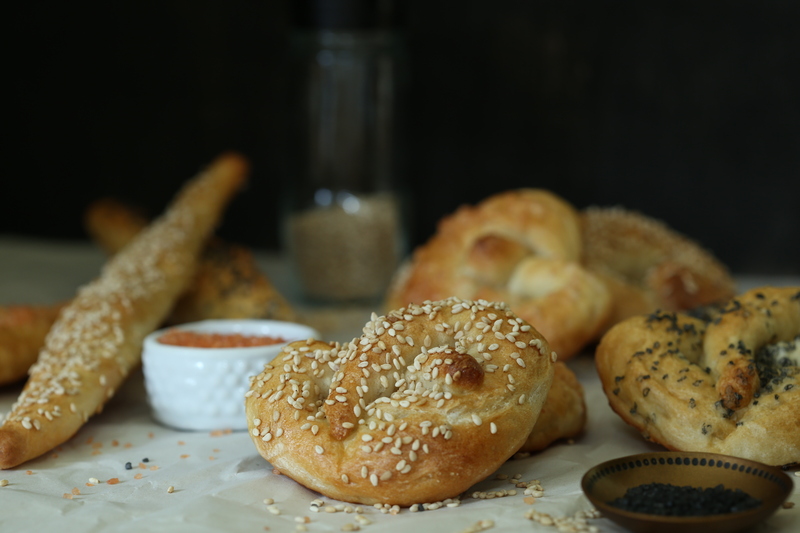 If I do, I will use all-purpose flour and portion them a little larger so that they are a little more like a pretzel. Each Tuesday, the members of Tuesdays with Dorie post about their experiences baking from the books Baking with Julia and Baking Chez Moi. If you would like to read about it or join us, pick up a copy of the book and visit the website. To see how the other member fared with this recipe, check the LYL page. I like the shaping variation you used and the salt was a good idea. For a half batch, I used about 2 3/4 – 3 cups of high-gluten flour. whenever a bread recipe calls for bread or AP, I never know which one to pick! so i usually do a 50-50 mix (I did that with these). I like your shapes though…the longer ka’kat look like a little sesame-seeded bread called a “Jerusalem baguette” that I pick up often from a bakery in Union Square (Breads Bakery). when a recipe lists both, I usually go with what is listed first since it seems that it is the preferred choice. this time, that wasn’t the best choice since it made them so tough! You are so lucky to shop in Union Square; way back in the day when I worked in NYC, Union Square was a pretty rough place to visit and I generally avoided it! I made a half batch but definitely needed more than 2.5 cups of flour. I also skipped the mahlab, but after reading everyone’s posts I wish I had made more of an effort to find some. Oh well. It was still a fun one to try! I was really happy with these, but I also was able to get some mahlab. It definitely adds an amazing aroma to the bread.